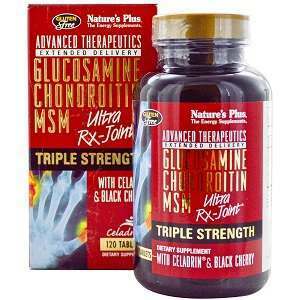 Nature’s Plus Triple Strength Ultra Rx-Joint is marketed as an advanced joint support formula product. The proven benefits of glucosamine, chondroitin, and MSM are united in this product with the support of Celadrin® and black cherry. The result is a combination that the vendor claims provides nutritional support for joint lubrication and mobility. TRIPLE STRENGTH Ultra Rx-Joint provides these benefits around the clock. Four tablets twice daily (or 8 tablets a day which means that a 120 tablet bottle will last for 15 days). The product source provided no information on the price of the 120 tablet triple strength product bottle. The product is apparently sold through a network of independent dealers and not directly from the product vendor. No information was provided about guarantees or product returns in the product source. The product source itself did not provide any phone number for customer service but did contain a template to use to forward questions to the company via their website. Anyone thinking about buying this product should use the product website to locate a dealer in their area in order to ask about product price, warranties and return information. Mark Stevens	reviewed Nature’s Plus	on March 8th	 and gave it a rating of 2.5.